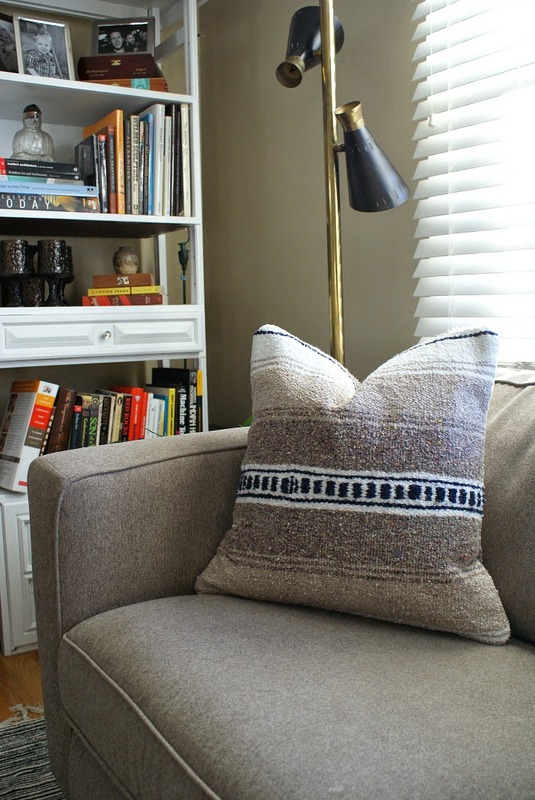 Urban Acreage: Serape Pillow Tutorial + Giveaway! Serape Pillow Tutorial + Giveaway! If you're feeling crafty, I put together a brief tutorial on how to make an envelope style pillow cover. Or, if sewing isn't your thing but you dig this look, scroll to the bottom and enter to win the second cover I made! 1. Measure and cut one 20" x 20" piece of fusible interfacing and two 15" x 20" pieces. 3. Cut out the fabric pieces that now have interfacing fused to them. 4. Hem one long edge of each 15" x 20" piece. 5. Pin all three pieces, right sides together. The two 15" x 20" pieces will overlap, making an envelope style opening in the back. 6. Sew all four sides, remove pins and turn it right side out. 7. Stuff with a down pillow, fluff and karate chop it! Note: If you haven't made an "envelope" style pillow before, this post might help. It's the same concept, only with this project you start by fusing interfacing to the serape pieces to keep them from unraveling.